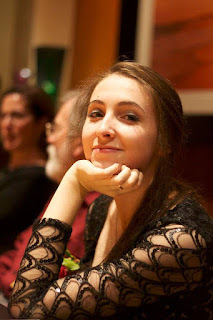 This week we interviewed Sophia Andreyev. Sophia is a senior working on her second piece for Raw Edges. Raw Edges is our next show on May 6-8. What is the overall idea/ concept behind your piece? I’m choreographing as part of my capstone project which is on multimedia performance. I wanted to find a concept that would support this concept well. I decided to create a piece about two people who are at the end of a relationship, who are struggling to leave and are looking back on the beginning. In addition to the live dancers there will be a projected video of the same dancers, which will serve as a window into their memories. What inspired your idea for this piece? As a said before, I was looking for something where I could utilize several different ways of story telling to create the piece. I also have a tendency to lean to nostalgic concepts in my choreography. These two elements mixed with some personal experiences led to the concept. How do you choose the different aspects of your piece: music, dancers, costuming, lighting, etc? I actually struggled with finding music for the piece for quite a while. I was also having a hard time coming up with choreography while searching for the song, but when I heard it, all the pieces fell together so easily. I chose the dancers that I did because I knew that they would understand the feelings behind the piece and be able to capture and project the right intentions. I also chose them because I knew that they would be willing to experiment and play around with different ideas. How do you approach choreographing a piece? First I usually work on a couple pieces of choreography that I can use as a source to draw on for the rest of the piece. Then once I am in the studio with my dancers, I use both the phrases I created and some new movement in the same style. Most of the movement comes pretty spontaneously which I like the feel of. I think that way it also has some room to evolve on the dancers and so then looks more natural. What is the most exciting part about choreographing? I think my two favorite parts about choreographing are both coming up with the initial material and then watching as my cast members make it their own. How much time do you spend in the studio, both on your own and with the dancers in your piece, to determine your choreography? For this piece I haven’t spent that much time in the studio. I have about three hours a week to set the choreography on my dancers, besides a few minutes here and there to work some things out, that’s pretty much all I use. How is the process different this year when choreographing for your capstone versus last year when you choreographed for Raw Edges? Last year I felt as if I hadn’t fully developed the concept behind the piece and it was lacking for that. This year I am much more confident in the work. For the most part because I have been living with it for the better part of a year. If you could offer insight as to how the capstone is completed with choreography? I think it is really important to find a general idea for your capstone that you are really passionate about. I would recommend that you find that before you really think of an idea for your piece. Because you also have to write a research paper on your topic, it allows for a really deep and complex piece if you put the work into it. Once you have put in all the grunt work, the ideas about the actual piece evolve so much more easily. Last week, the Mercyhurst Dance Department had the pleasure of hosting a number of master classes taught by Joseph Morrissey. Currently, Morrissey is the director of dance at Interlochen Center of the Arts. Prior to this position he was the Director of Artistic Planning and Touring for The Hong Kong Ballet. He has danced with Boston Ballet, Bavarian State Ballet in Munich, Germany, and the Charleston Ballet Theatre. He also holds a degree in Classical ballet from Indiana University and a masters in Performing Arts Administration from New York University. Joseph Morrissey taught master classes at Mercyhurst from Thursday, March 31st, to Saturday, April 2nd. His enthusiasm and excitement flooded into the classes, pushing the students to continue to think about their dance in a new way. His brisk combinations and exact positions encouraged quickness of mind and body. Likewise, the emphasis on the use of plié helped the dancers feel a rhythmic pulse through each combination, making the movement more natural and fluid. In his short time at Mercyhurst, Morrissey created a personal connection with each student, encouraging and correcting each individually. We are very thankful that Joseph Morrissey was able to come and share his talent with the Mercyhurst Dance Department. A group of 10 students left after classes on March 4th to head to Kalamazoo, Michigan. ACDA, American College Dance Association, holds regional conferences every year where masterclasses are held and students perform innovative choreography. This year Mercyhurst’s Dance Department brought ten students and three pieces to perform. Two of these were performed at the adjudicated concert and another was held at the informal showing. All the students took masterclasses and rehearsed all day leading to an educational and inspirational weekend. Personally, I looked forward to taking an array of different types of classes, ones that I would not have normally had the opportunity to take. The classes offered ranged from Creole Fusion, Improvisation, Fosse Batman, Contemporary Modern, to Classical Ballet. All these different classes challenged me to broaden my artistic horizons and examine dance in a new light. Although it was only a mere five days, I learned how to incorporate all these different techniques and ideas into my own artistic expression. The students performed three different pieces over the weekend, two at the adjudicated showcase and one at the informal showing. The pieces performed were Solveig Santillano’s Laura’s Grace, senior, Esmae Gold’s The Oath, and junior, Roni Ply’s Insomniac’s Dream. 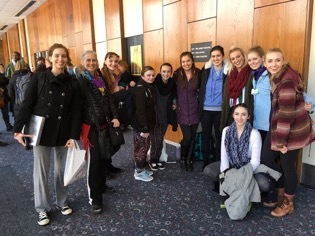 Being able to participate in showings with such a vast array of dance styles and choreography was such an incredible experience for all the dancers. I know this busy weekend of dancing, performing, and spending time with other wonderful dancers will stay as one of the high lights of my year. With our last audition approaching, here are some tips for auditioning. Make sure you are dressed appropriately. If you are taking a ballet class- dress for that ballet class. If you are planning on taking an extra Modern class after your audition- make sure you bring an extra pair of black tights. Remember- you can never go wrong with a black leotard. Even if the company or school does not specify what they want you to wear, a black leo is always a good go-to! If you are not sure of what you should wear take a look online at what dancers are wearing during their classes or even call if you are completely baffled. Make sure you have pointe shoes that are not too dead and look clean. Make sure your ribbons stay secure throughout your dancing and that you don't have any stray strands hanging off the toes. Treat every audition as just a class! It's really not that big of a deal. Also, don't be afraid to approach other students that attend the college if you have questions before, after, or during class! Everyone is happy to help. If you want, (or have dietary restrictions) pack your food. This was helpful for me when I went to audition for schools since then I knew what I was eating and I didn't have to eat fast food right before plies. Make sure your head shot clearly represents yourself as you are now. Do not use a picture that looks nothing like you. Head shots are ways the school or company knows who you are after the audition. Glamour shots and airbrush galore are not always realistic. Be confident! Make sure you are confident in your abilities no matter what! If you can't complete 32 fouettes on audition day, don't sweat it! Be confident in your 4 or so and get on with the class with a positive attitude. Hunter is a freshman with the dance department all the way from sunny Miami, Florida. Here, he offers some insight into his freshman year! What have been the highlights of your year so far? Being in a class of great people. I love waking up every morning and knowing that I'll soon be in class dancing with some of my best friends. Also, being able to perform in Match Girl this previous semester has been a highlight. What is the most important thing that you've learned? You don't need to be perfect when you come to college. College is a time for you to grow and learn from your mistakes. All you need is hard work and ambition and you will have a recipe for success. What are some your favorite memories with the dance department? Preparing for the performance of Match Girl last semester and being backstage with all the anticipation stands out as one of my key memories in my first year with the dance department. I also look forward to the Thursday BFA ballet class because it's just another opportunity where I can focus in class with the support of the teachers and other dancers. What advice would you give incoming freshman? Make sure to work hard and commit yourself every day and eventually everything else will come through for you. Be patient with yourself because in dance you have to constantly pick yourself back up. Also, appreciate the present and fall in love with ballet because it is your life now and these are years you won't get back.